Have you ever gone to dinner at someone’s home for the first time and timidly approached the front door hoping that a familiar face would answer? 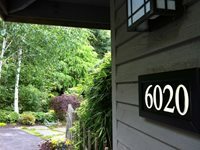 Many homeowners forget to think about whether or not their address is visible at night, leaving visitors to wonder if they are at the right house. Remember the little stars you stuck to your ceiling as a child? Or what about frantically trying to catch fireflies in a mason jar? For years kids have been fascinated by things that glow. 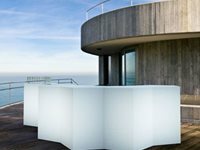 Now adults can join in on the fun with these outdoor lighting options offered by Orange Skin. When I was young my mom would light her grandmother's oil lamp every time the power failed. There was something magical about the dancing flame and the way it lit our home. 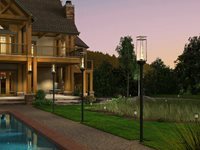 Now you can have this magical light quality outdoors with the Tempest Torch. The moon has always been a source of mystery and romance. Children spend hours trying to find the man in the moon, conspiracy theorists question whether the 1969 moon landing was staged and young lovers gaze into each other's eyes beneath its light. 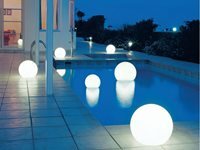 Bring even more of this mystery and romance to your garden with Moonlight® globe lights. 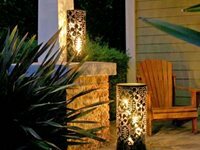 These outdoor lanterns are perfect for providing accent lighting on your deck or patio. When illuminated with candles light shines out small pinholes to create a glowing pattern. The lanterns can be set on the ground or a table or hung from a tree or structure.